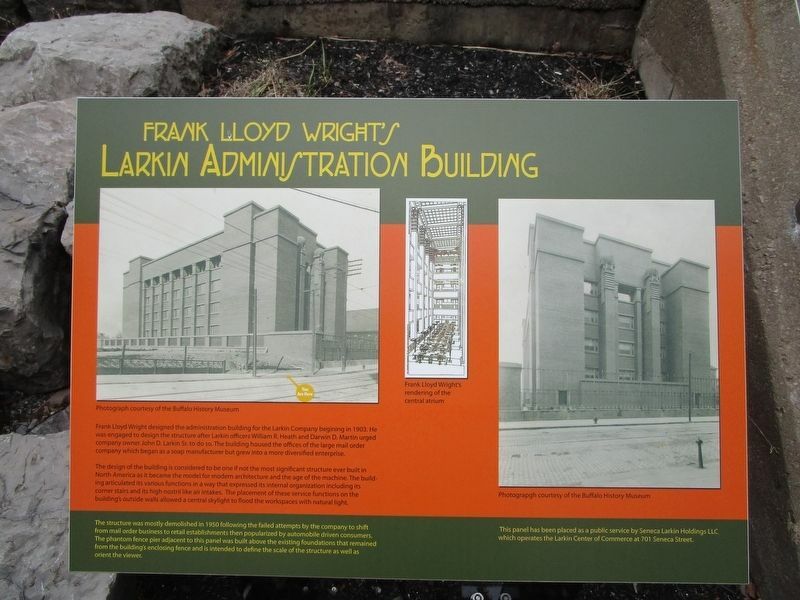 Frank Lloyd Wright designed the administration building for the Larkin Company beginning in 1903. He was engaged to design the structure after Larkin officers William R. Heath and Darwin D. Martin urged company owner John D. Larkin Sr. to do so. The building housed the offices of the large mail order company which began as a soap manufacturer but grew into a more diversified enterprise. The design of the building is considered to be one if not the most significant structure ever built in North America as it became the model for modern architecture and the age of the machine. The building articulated its various functions in a way that expressed its internal organization including its corner stairs and its high nostril like air intakes. The placement of these service functions on the building's outside walls allowed a central skylight to flood the workspaces with natural light. The structure was mostly demolished in 1950 following the failed attempts by the company to shift from mail order business to retail establishments then popularized by automobile driven consumers. View is eastward on Clinton Street. 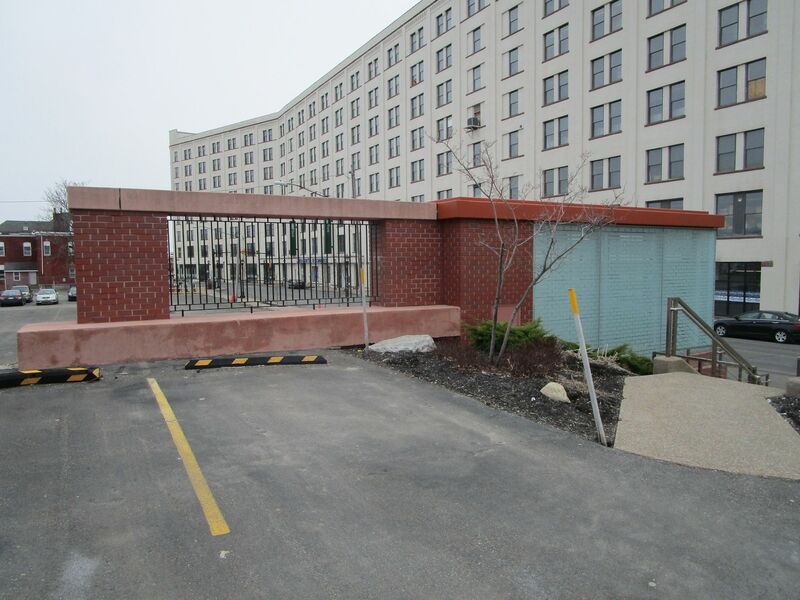 The phantom fence pier adjacent to this panel was built above the existing foundations that remained from the building's enclosing fence and is intended to define the scale of the structure as well as orient the viewer. Frank Lloyd Wright's rendering of the central atrium. Location. 42° 52.593′ N, 78° 51.132′ W. Marker is in Buffalo, New York, in Erie County. Marker is on Clinton Street (New York State Route 16) 0.2 miles west of Swan Street, on the left when traveling east. Touch for map. 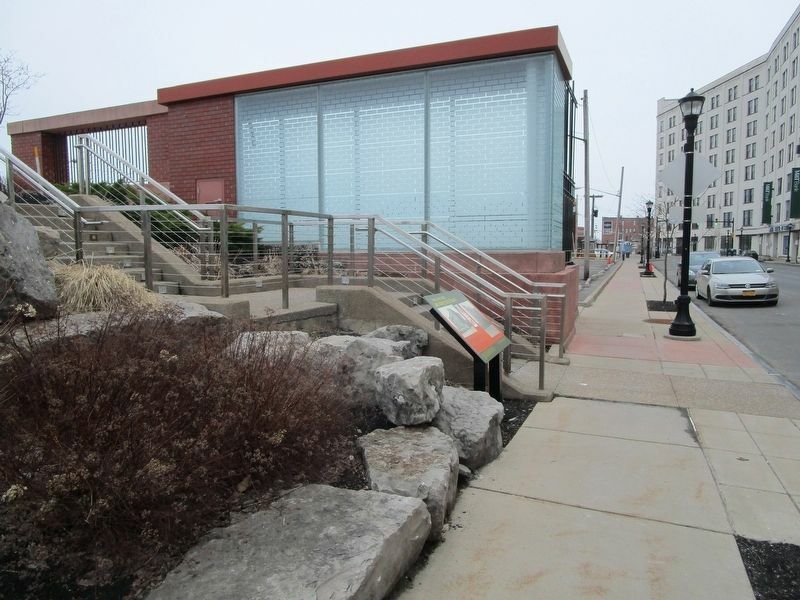 Marker is at or near this postal address: 680 Seneca Street, Buffalo NY 14210, United States of America. Touch for directions. Other nearby markers. At least 8 other markers are within walking distance of this marker. A different marker also named Frank Lloyd Wright’s Larkin Administration Building (a few steps from this marker); a different marker also named Frank Lloyd Wright’s Larkin Administration Building (about 300 feet away, measured in a direct line); William Wells Brown (approx. 0.7 miles away); Henry Wolanski (approx. 0.9 miles away); The Nash House (approx. one mile away); In Memory of the Valiant Service (approx. one mile away); First Polish Colony (approx. one mile away); St. Stanislaus Church (approx. one mile away). Touch for a list and map of all markers in Buffalo. Credits. This page was last revised on April 8, 2019. This page originally submitted on April 8, 2019, by Anton Schwarzmueller of Wilson, New York. This page has been viewed 36 times since then. Photos: 1, 2, 3. submitted on April 8, 2019, by Anton Schwarzmueller of Wilson, New York.